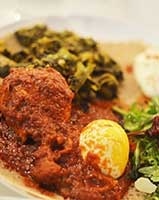 There's always been a lack of Ethiopian lunch restaurants. Perhaps it's the price of making the food, or perhaps it's not worth the effort for some other reason. When I read that the expert coffee makers Auel were opening a restaurant in Tensta Konsthall, I resolved to go there as soon as I could. That was indeed the right decision to make. The coffee was great as usual, and the food was wonderful. It was indeed precisely what I had been looking forward to. The restaurant is located in the entrance to Tensta Konsthall, right behind the subway entrance, making it very accessible by subway. The framing of the art exhibition hall also gives it a very modernistic appearance, which is quite rare for Ethiopian restaurants. While they do serve the usual "café food", the only reason to go here for food is "today's special" which is a mix of Ethiopian dishes served with rice or injera, a slightly elastic flatbread with a spongy texture. The food is served on top of it, like a crêpe that isn't folded up. Executive summary: it was great. The spice of the sauce blended nicely with the slight sourness of the injera, and the mild yogurt sauce topped it off excellently. In short - a place I can really recommend and will return to.